Using dried flowers and herbs, Amy Wendland integrated the once living into an abstract sketch. 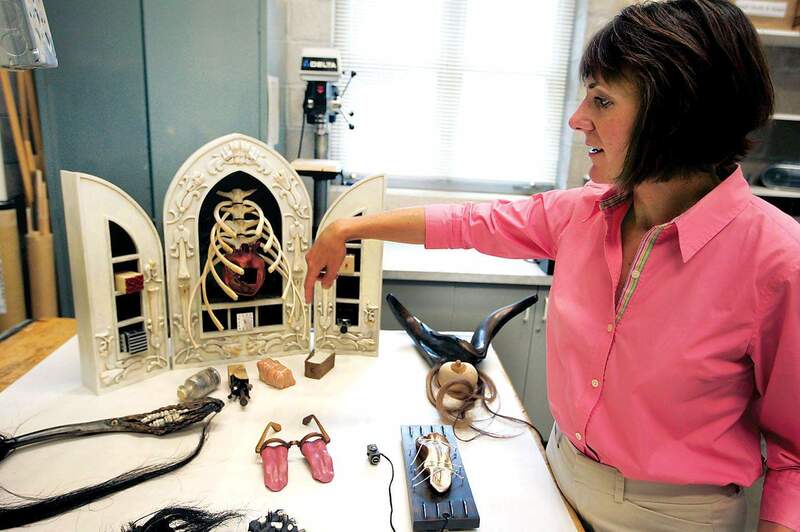 Amy Wendland displays some of her pieces Wednesday in her studio at Fort Lewis College. Amy Wendlands artwork is unquestionably unique, but it also is precise, extremely well-crafted; often humorous in a tongue-and-cheek sort of way, edgy, intriguing and very creative. While she is an extraordinary draftswoman (she has a degree in illustration), her true passion is sculpture and assemblage. 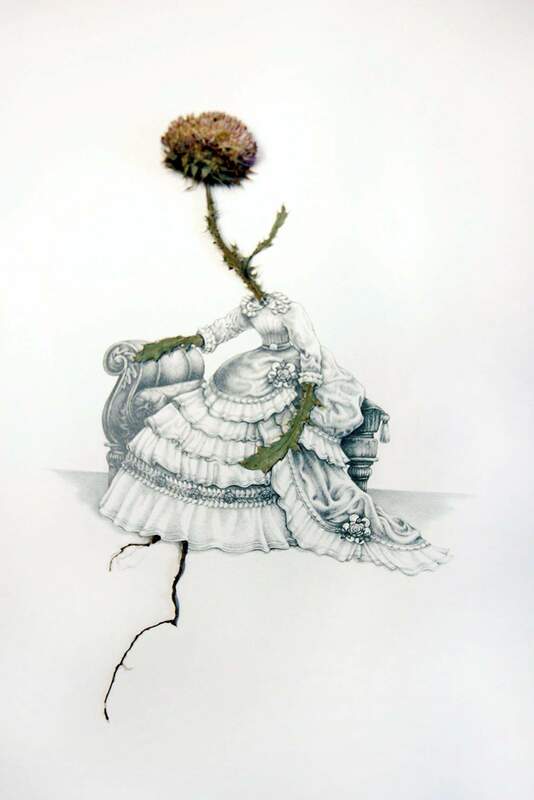 Most of her art is tabletop size, intimate, and incorporates materials as diverse as rusty cog wheels, bone (one of her favorites), plant life, horse hair, found objects and even teeth. Wendland received her bachelors degree in illustration from Rhode Island School of Design and then worked commercially as a graphic artist and designer creating book covers, advertisements and logotypes as well as exhibit drawings for the Elvehjem Museum in Madison, Wis.
After almost eight years of working for clients and following someone elses muse, Wendland felt the need to create dimensional objects and returned to school to earn masters degrees in sculpture and graphics from the University of Wisconsin, Madison. Her advanced degrees allowed her to teach at a high level, and she applied for positions on the east and west coasts in addition to Fort Lewis College. It culminated in 2000 with her taking the job in Durango, where she currently serves as an associate professor in FLCs Art Department. She also was chairwoman of the department and its interim dean. Wendland frequently lectures about art and design and also has been juror of several local exhibitions. Her prior experience teaching students in other locales gave her an appreciation for students attending FLC. They are the nicest. They have a sense of humor and possess a western self-confidence, she said. When discussing her acceptance of the teaching position at FLC instead of opportunities in Boston and Sacramento, she proudly shows the studio space adjoining her modest office in the campus art building, a huge perk. It is spacious, with an inordinately high ceiling and is spotlessly clean. The order and neatness is striking for an art studio workshop, but when you consider the precision of her work, its immaculate execution and the obsessive perfectionism that drives her, it isnt a surprise. Having the studio right next to her office gives her the ability to work on pieces whenever there is time between her teaching schedule, and it allows her to enter as many as six shows a year, all while remaining independent and unattached to a gallery, which is her preference. While that comment might seem pretentious, a condition she abhors, it really isnt. Teaching not only inspires her and her fortunate students but also gives her the freedom to create for herself while respecting the viewer, she said. Well all have the chance to see a collection of her work in November, when she will be the featured artist in the library at the Durango Arts Center. Each month, Herald contributing writer Stew Mosberg spotlights an influential member of the arts community in La Plata County. This months subject is Fort Lewis College Associate Professor of Art Amy Wendland.